After spending a few hours in London’s National Gallery, I’ve had enough of appreciating great art. I’m more than ready to stagger down the steps into Trafalgar Square, navigate through the crowds, cross the street, and disappear down the well-worn steps into the ancient crypt of St. Martin-in-the-Fields Church. The church was once literally “in the fields,” far outside the center of London. Now it’s at the epicenter. The day before I visited was May Day, when tens of thousands of demonstrators converged on the square. (In most of Europe, May Day is similar to Labor Day in the United States. In Europe, people march in support of working people on this day). On any day, though, Trafalgar is full of people. 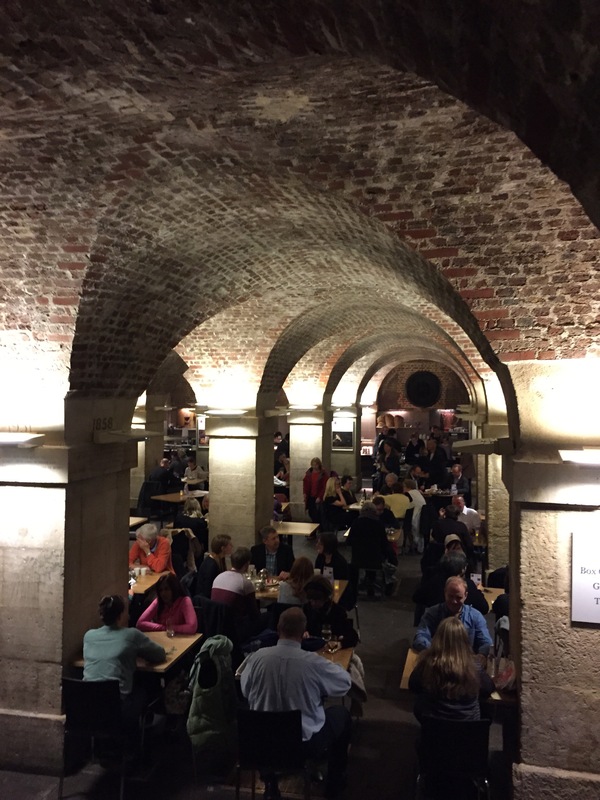 The centuries-old crypt underneath the church has been turned into a cheerful cafeteria and venue for jazz concerts. Are we walking on top of very old tombs? I don’t think so. I think these are grave markers from centuries past, when the church still had a churchyard around it. I think that tombs once in the crypt were moved elsewhere during one of the many rebuildings of the church over the centuries. Of course, like many British churches, the site of this one dates back to Roman times–or very likely even pre-Roman pagan times. So there’s no telling what is deep underground. If there are spirits of the departed, I think they enjoy the company. The food is cooked onsite, inexpensive, healthy and delicious. 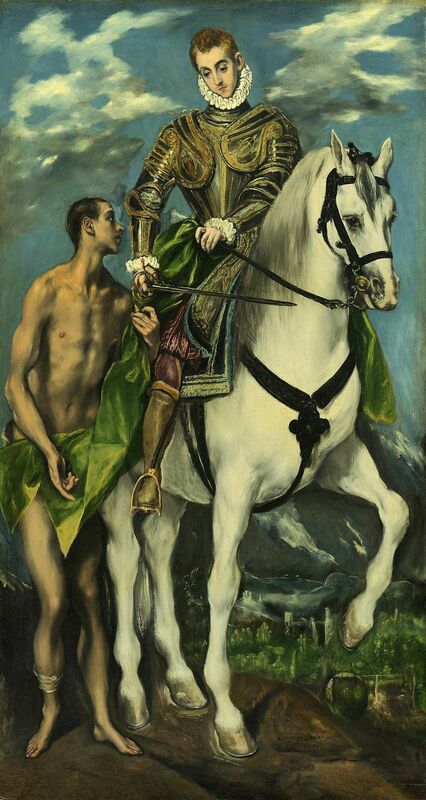 Who was St. Martin of Tours? He was a 4th-century Roman soldier who became one of the first conscientious objectors when he decided not to fight. He offered to go to the front lines unarmed, but fortunately the enemy sued for peace and he was allowed to leave the army. He eventually became Bishop of Tours, a post he accepted reluctantly because he preferred to serve the poor directly. He was well known enough in his day to have a biographer who followed him around and wrote about him, so it is pretty well documented that he once impulsively cut his warm military cloak in half and gave it to a near-naked vagrant in the dead of winter. Legend has it that the next morning the cloak was made whole again. 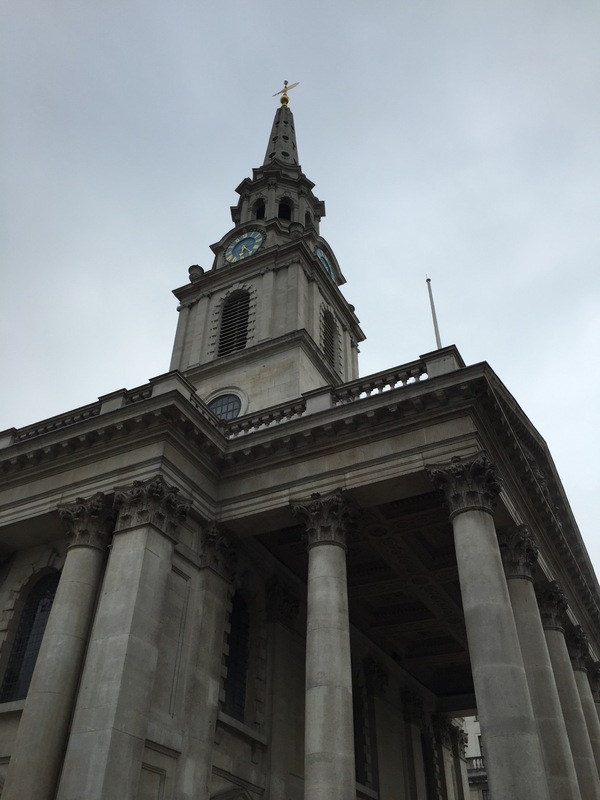 The rest of his life was devoted to serving the poor and outcast, and that is the mission of St. Martin-in-the-Fields today. 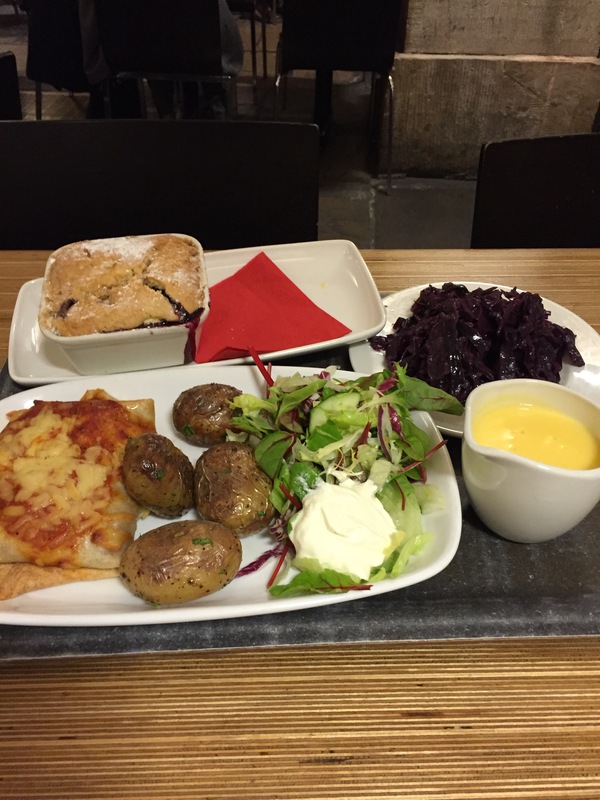 The church’s cafe and its many concerts support its work with the poorest of the poor in London. 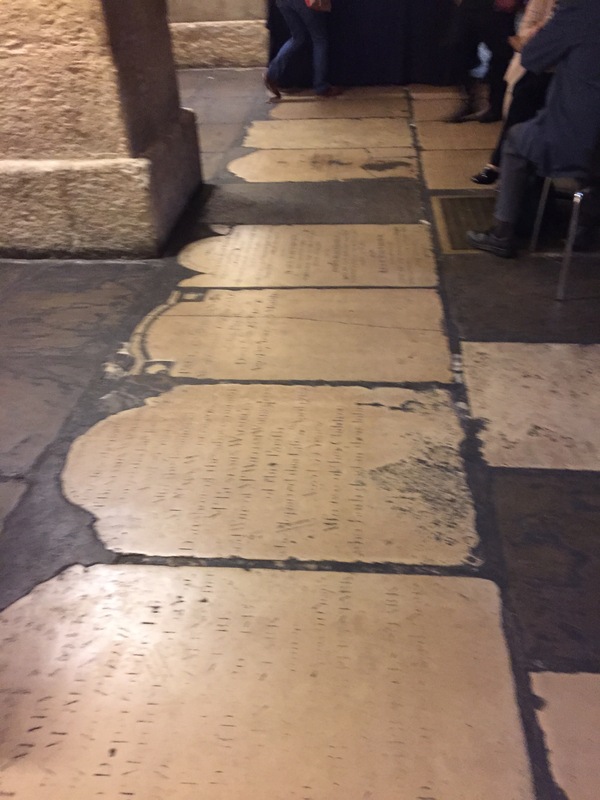 I’m happy to contribute to the work of this famous church by joining the lively crowd in the once-silent crypt. Join me next time for more explorations in the art and history of Europe and the British Isles! 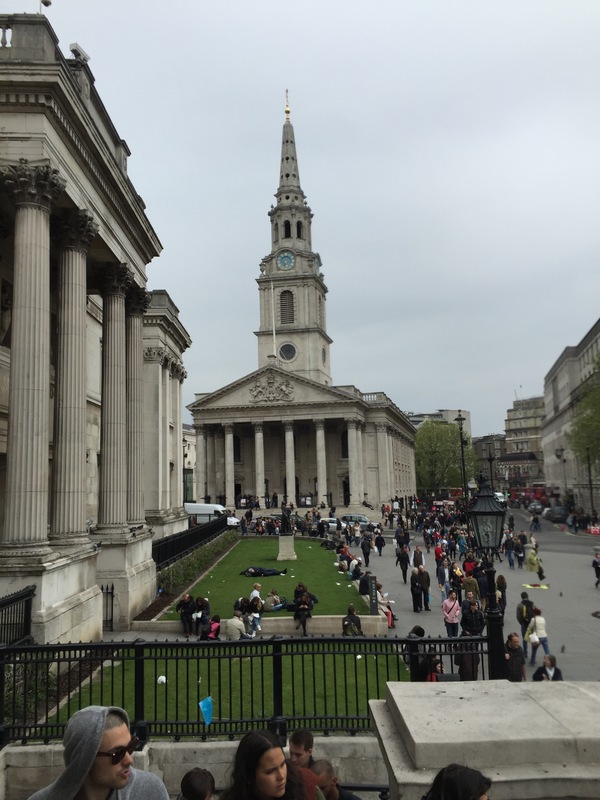 This entry was posted in Affordable Europe, British Isles, Cathedrals and Churches, England, Historical Figures and tagged El Greco, London, National Gallery, programs for the homeless in London, St. Martin and the Beggar, St. Martin of Tours, St. Martin-in-the-Fields Church on May 9, 2015 by Claudia Suzan Carley.